Wild Idaho Rising Tide will post more of the most pertinent Idaho Transportation Department (ITD) public records about a proposed hydrocracker section transport up U.S. Highway 95 and Idaho Highway 200, en route to the Calumet Great Falls, Montana, tar sands refinery, as we scrutinize and sort about 100 documents received on July 31, 2014. Coal is not among the ventures the Port of Lewiston is pursuing, as it seeks business for its expanded container dock. The port has had three or four inquiries about coal in the past 3 1/2 years, with the most recent arriving sometime in the fall. But Port Commission President Mary Hasenoehrl said the port has never actively sought coal customers. “The Port of Lewiston is not currently working with anyone regarding coal shipments,” said Port Manager David Doeringsfeld. Any port along the Snake and Columbia river system has likely handled requests similar to those put to the Port of Lewiston, Doeringsfeld said. Barging coal on the system is an option since coal is being mined in Wyoming and Montana and shipped overseas. The comments from Hasenoehrl and Doeringsfeld followed a records request by the Lewiston Tribune seeking any documents the port had involving coal from January 1 to July 23. With plenty of potential road and rail blockades on the near horizon, Wild Idaho Rising Tide is holding weekly potluck meetings every Tuesday at 7 pm at the WIRT Activists House in Moscow. Please see the WIRT Events Calendar and recent newsletters posted on the WIRT website, for further information about these topics of upcoming strategizing and planning sessions [2, 3]. On Thursday, July 24, two Wild Idaho Rising Tide (WIRT) activists scouted the Port of Wilma, across the Snake River from Clarkston, Washington, to document with photos and ascertain any changes at the fenced compound where Bigge Crane and Rigging stores the last of three rusty, cylindrical, hydrocracker sections stranded since mid-December 2013. 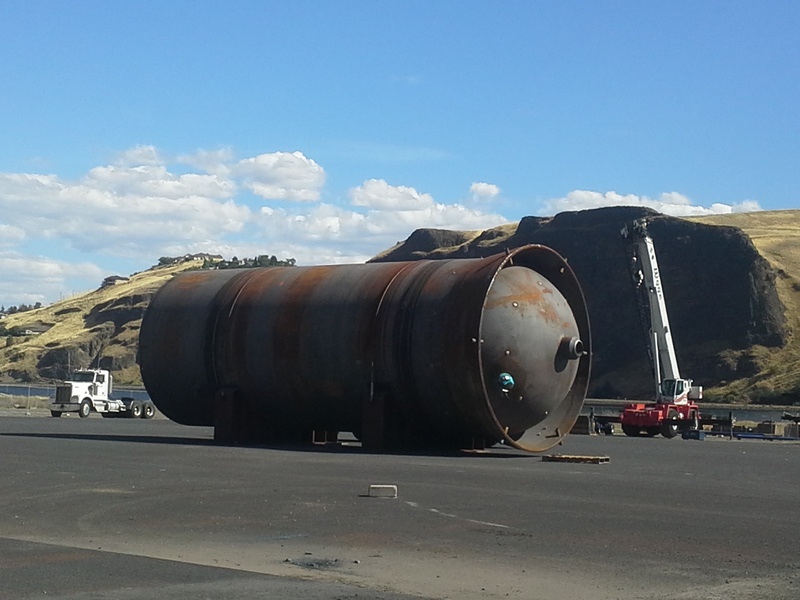 Participants in the Nez Perce Environmental Summit on Saturday, July 19, discovered the two other, larger, megaload parts vanished, with crews still in the port lot leased by Omega Morgan in late 2013, for its two massive evaporator cargoes . Last observed on short, 12-axle trailers at the port on Tuesday, July 15, the two heavier, missing loads, 573,000 and 661,000 pounds each, likely departed by barge downriver or by train on the Watco Companies Great Northwest Railroad to the Tri-Cities, Washington . According to late-May newspaper articles that suggested megaload rail travel, haulers could have transported the shipments on Schnabel train cars as oncoming traffic to potentially explosive, West Coast-bound, unit “bomb trains” of fracked Bakken shale oil. 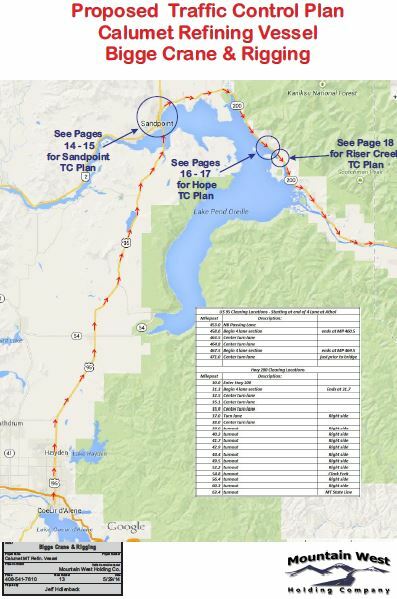 The behemoths could currently be moving across eastern Washington and northern Idaho on either Union Pacific or Burlington Northern Santa Fe rail lines to Bonners Ferry, Idaho, then eastward on the BNSF railroad to a spur line heading south from Shelby to the Montana Refining Company in Great Falls. The hydrocracker column formed by stacking the three purportedly irreducible components upright constitutes equipment essential to tripling Calumet Specialty Products Partners’ refinery production of Alberta tar sands, Bow River crude, and Bakken shale oil. Two of the three megaloads bound for a Calumet refinery in Great Falls, Montana, will leave the Port of Wilma by rail, not truck. Exactly when the shipments will depart the Port of Wilma is not being disclosed, said company spokesman Noel Ryan. Calumet will provide an update on the Great Falls project, which is doubling the capacity of the refinery, in its quarterly earnings report in early August. Ryan said the company will not get into the details of how the machinery at the Port of Wilma is being transported. Ryan’s statements came after days of heavy speculation by megaload opponents that two pieces of the equipment have left the port. The machinery is so large that it would take up two lanes of highway, if it went by road. Support the Land Defenders Arrested on Monday at the Utah Tar Sands! On Monday, July 21, about 80 climate justice land defenders peacefully expressed their First Amendment right to free speech, by staging a massive direct action at the site of U.S. Oil Sands’ tar sands strip mine at PR Springs in the Book Cliffs, Utah. The protest that blocked mining facilities construction culminated a week-long direct action training camp held within two miles of the mine. Participants of Climate Justice Summer Camp traveled from numerous organizations, states, and sovereign tribal nations to learn direct action skills and build networks. These inspiring heroes left the comfort of their homes, the company of their families, and the security of their jobs to fight for the future of this beautiful, historical area. In April 2014, the Idaho Oil and Gas Conservation Commission voted to enter into negotiated rulemaking, to improve and clarify the existing Rules Pertaining to Conservation of Crude Oil and Natural Gas, IDAPA 20.07.02. The commission published a notice of intent about this process in the Idaho Administrative Bulletin on June 4, 2014. The Idaho Department of Lands (IDL) is holding four negotiated rulemaking public meetings in the Idaho Capitol at 8:30 am MDT on June 6 and 18 and on July 2 and 22 . Purportedly state-initiated, but primarily industry-instigated, changes to the rules governing oil and gas development in Idaho are open to oral and written public comments and eventual hearings on the final draft of the proposed rules. IDL oil and gas program manager Bobby Johnson has managed these rulemaking sessions that have drawn the attendance of agency staff, industry representatives, and stakeholders from Alta Mesa, the Idaho Association of Counties, Idaho Conservation League, IDL, Idaho Department of Water Resources, and Idaho Petroleum Council, and concerned county commissioners, Gem and Payette county residents and landowners, and Boise citizens. According to at least four Saturday, July 19, Wild Idaho Rising Tide (WIRT) eyewitnesses, two of the three Calumet tar sands refinery hydrocracker sections stranded at the Port of Wilma, Washington, since mid-December 2013 have vanished . 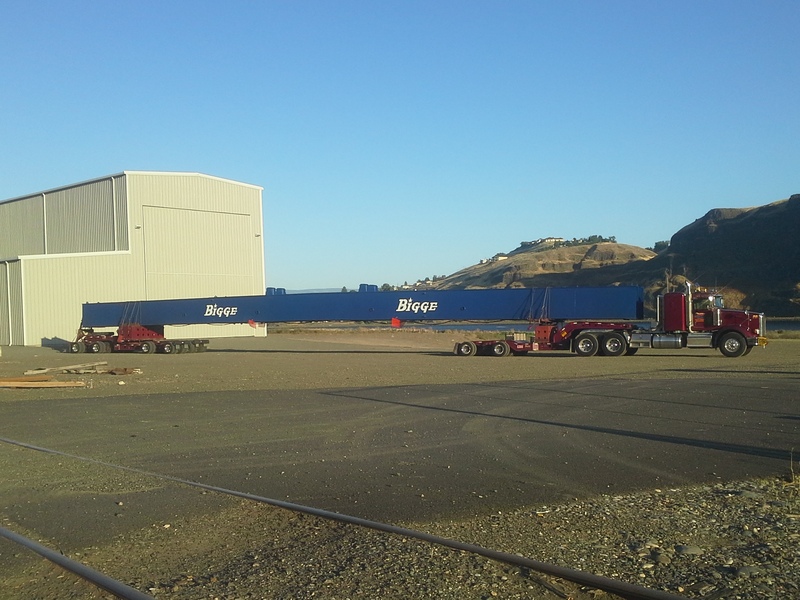 During the week of July 20, Bigge Crane and Rigging of San Leandro, California, is likely hauling these megaloads via river, rail, or road, from the port on the Snake River near Clarkston to the Montana Refining Company in Great Falls. Last observed and described (but not documented with photos?) on short, heavy-duty, 12-axle trailers at the port on Tuesday, July 15, the loads were missing when a Saturday morning scout noticed crews still in the port lot previously leased for storage and staging of Omega Morgan “water filtration units.” Questions about whether the hydrocracker parts departed by barge or rail downriver still linger, but after only a few days of travel, these megaloads may not have gone far. The Monday, July 21, Climate Justice Forum radio program hosted by Wild Idaho Rising Tide gratefully welcomes Alma Hasse and Tina Fisher of Idaho Residents Against Gas Extraction, from ground-zero of Idaho oil and gas exploitation, Payette County. Alma and Tina will provide updates on Idaho oil and gas negotiated rulemaking sessions, rule revisions, and disputes, especially forced pooling and minimum setbacks, as well as Bureau of Land Management mineral leasing decisions and public meetings and premature state permits. Among other topics, they will also talk about Gem County opposition to private property rights compromised by oil and gas rules, and current industry infrastructure developments and practices in Payette County, including tapping irrigation water for operations. Broadcast on progressive, volunteer, community station KRFP Radio Free Moscow every Monday between 7:30 and 9:30 pm PDT, live at 90.3 FM and online, the show also covers continent-wide climate activism news and dirty energy developments, thanks to the generous, anonymous listener who adopted program host Helen Yost as her/his KRFP DJ. Port of Wilma Megaloads on the Move! Borg Hendrickson of the People of Highway 12 Fighting Goliath wrote this week that observers noticed on Tuesday, July 15, that California heavy-hauler Bigge Crane and Rigging has placed two of the three megaloads parked at the Port of Wilma on relatively short, 12-axle trailers. The third behemoth continues to rust on jacks. Originally proposed for transport by Mammoet, from the port to the Calumet tar sands refinery in Great Falls, Montana, via U.S. Highway 95 and either Interstate 90 or Idaho Highway 200, the tremendously heavy but not particularly large or long parts of a hydrocracker have remained stalled at the port across the river from Clarkston, Washington, by logistical problems and regional resistance since December 2013. Mammoet had planned to carry them each on interconnected trailers propelled by one pull truck and two push trucks, together stretching over 450 feet and weighing 1.6 million pounds, the longest and heaviest megaloads to ever crush Highway 95. 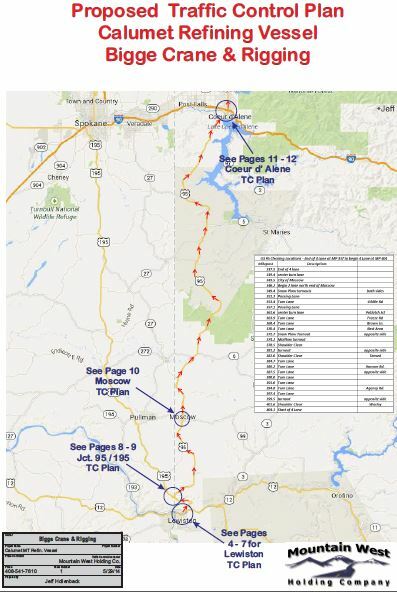 As chronicled by late-May, Idaho newspaper articles and June WIRT scouting trips, photos, and newsletters, two of these loads could possibly travel by rail and the other by road through the Moscow, Idaho, sacrifice zone for all failed Highway 12 attempts . Because the short Bigge trailers under two colossal loads likely do not meet state requirements for distributing load weights over numerous axles during cross-state highway journeys, Wild Idaho Rising Tide (WIRT) and allies anticipate that Bigge is preparing them for their departure either by rail, on Watco Companies’ Great Northwest Railroad, or by barge, shipped back down the Snake River probably to the Tri-Cities, Washington, for transport by rail or highway through eastern Washington and northern Idaho.